Shelton, CT, January 2, 2017 – Centrix, Inc. has developed a series of easy-to-use risk assessment tools that can be used by clinicians to help patients understand the role prevention plays in maintaining great oral health throughout their lifetime. These downloadable forms, office signage and patient outreach content are available online at https://www.centrixdental.com/adultfluoride. In the latest issue of RDH, Donna Lynn Brogan, RDH, BS discusses these tools and how routine fluoride varnish application can have an immediate and positive impact on oral health. The new Centrix Adult Prevention program encourages conversations between the clinician and the patient. For example, the patient self-assessment form enables easy evaluation of the patient’s risk factors providing a forum to discuss next steps in oral health prevention. Centrix also developed tools to increase preventive care awareness, such as waiting room signs, patient re-care postcards, and copy for advertisements and social media posts, to name a few. In the RDH article, Donna Brogan elaborates on the many risk factors inherent in adult patients, from multiple restorations and exposed root surfaces, to poor oral hygiene and common medications. For clinicians, she encourages opening up the dialog with adult patients about their level of risk and involving them in preventive treatment. There are several reasons Brogan cites as to why clinicians do not routinely apply fluoride varnish for adult patients, including lack of insurance coverage, difficulty of application, and an unpleasant taste, appearance and feeling in the mouth. Centrix has addressed all of these concerns by developing FluoroDose®, an award-winning fluoride varnish that is easy to apply, comes in multiple patient-pleasing flavors, inexpensive and leaves no unpleasant sensation on the teeth. 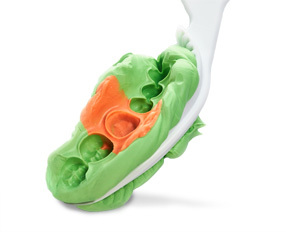 For more information about FluoroDose or to download free patient assessment tools, visit https://www.centrixdental.com/adultfluoride. Centrix was founded by Dr. William Dragan, a restorative dentist passionate about finding “a better way” to use and place modern materials in order to make dentistry easier. Today, our company is focused on solving the everyday challenges dentists and hygienists face with over 200+ innovative devices, materials and delivery systems. We are always looking for better ways and new ideas that will transform the practice of dentistry. 1. Azarpazhooh A, Main PA. Fluoride varnish in the prevention of dental caries in children and adolescents: a systematic review. J Can Dent Assoc. 2008; 74:73-79.